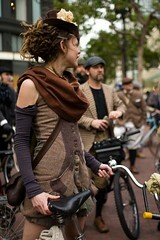 Tweed rides have become the Critical Mass of the elegant cyclist. They've been chronicled in media outlets as far flung as the Sunday Times Style Magazine (pdf), and The Chap (a Velocipedist favorite). San Francisco, Boston, Philadelphia, and D.C. all have tweed rides. Maybe there is one in your town. Maybe you should start one in your town. A more complete list of rides is up on the Riding Pretty blog. "Style not speed. Elegance not exertion." "You will find on tweed.cc details of past and forthcoming rides and tips for the sartorialist awheel." The Revolution is truly at hand.